We must become like children (see Matthew 18:3–4) to hear and accept this invitation. For in every Eucharist, it is the folly of the Cross that is represented and renewed. Yet Jesus repeats himself with gathering intensity in the Gospel today. Notice the repetition of the words “eat” and “drink,” and “my Flesh” and “my Blood.” To heighten the unbelievable realism of what Jesus asks us to believe, John in these verses uses not the ordinary Greek word for eating but a cruder term, once reserved to describe the “munching” of feeding animals. The foolishness of God is wiser than human wisdom (see 1 Corinthians 1:18–25). In His foolish love, He chooses to save those who believe that His Flesh is true food, His Blood, true drink. Fear of the Lord, the desire to live by His will, is the beginning of true wisdom, Paul says in today’s Epistle (see Proverbs 9:10). And as we sing in today’s Psalm, those who fear Him shall not want for any good thing. We approach, then, not only an altar prepared with bread and wine, but the feast of Wisdom, the banquet of heaven —in which God our Savior renews His everlasting covenant and promises to destroy death forever (see Isaiah 25:6–9). 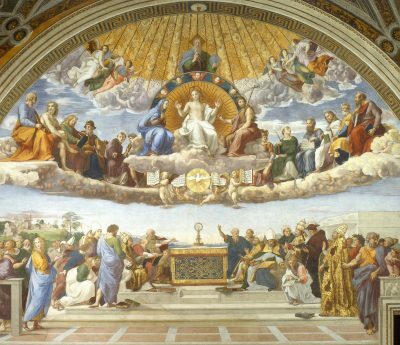 Let us make the most of our days, as Paul says, always, in the Eucharist, giving thanks to God for everything in the name of Jesus, the bread come down from heaven.